Is the UK economy at risk of countries or companies restricting the supply of key resources? Ian Mitchell and Serina Ng, economists from the Department of Environment, Food and Rural Affairs, assess the risks. Last year, a new horizon- scanning programme was established in the UK Civil Service. Its job is to identify a wide range of potential opportunities and threats, and bring together experts from across the Civil Service and externally to obtain new insights and challenge. At an early stage, the oversight group for the programme – the Cabinet Secretary’s Advisory Group, chaired by Sir Jeremy Heywood – identified ‘resource nationalism’ as an area for investigation. They commissioned a community of departments, led by the Department of Environment, Food and Rural Affairs (Defra), to undertake a study into what the evidence was saying and what the potential policy implications are. Why is resource nationalism an issue? Resource nationalism refers to negative, anti-competitive action designed to restrict the international supply of resources. Alongside well-known key resources like energy, food and water, a wide range of other natural resources are used in everyday products – for example, the materials in the components of our mobile phones, computers and rechargeable batteries. Many of these are not widely known, but could be important to the UK economy. Demand for resources is growing – there are expected to be more than 3 billion extra middle-class consumers by 2030 (McKinsey Report, November 2011: Resource Revolution: Meeting the World’s Energy, Materials, Food and Water Needs). This should create opportunities for UK manufacturing businesses to grow and prosper; but in some cases the natural resources or reserves required are unevenly distributed around the world. This uneven distribution represents a potential risk to supply chains. There can be incentives for countries to act in a way that restricts the international supply of a natural resource. For example businesses or nations may expropriate resources or change the terms on which they are extracted, to capture profit, or ensure they can satisfy their own domestic demand. These acts of resource nationalism can impact on UK economic activity through higher supply chain costs or, in the most extreme circumstances, disrupted supply. Although it may not be the main driver for short- term restrictive behaviour, there is, however, a strong profit incentive to maintain supplies to the global market. In the long-term, countries with valuable resources are likely to best maximise returns by accessing customers overseas as well as domestically. Experience with other resources such as oil and gas bears this out. It is extremely unlikely for the supply to be completely cut off, as profits are still to be had in the global market. While innovation and technology can change the nature of existing markets and help create new and better products that require less of these unevenly distributed natural resources, this process takes time and money. In the meantime economic damage from supply constraints could be considerable. Individual businesses are likely to assess and manage risks to their own supply chains. The work of the Defra-led team considered the complexity of identifying economy-wide risks and potential impacts. Our analysis indicates the risk of resource nationalism may be higher in some lesser-known metals and minerals than the higher-profile resources such oil, coal and gas. These materials are essential in everyday products such as mobile phones, computers and rechargeable batteries. 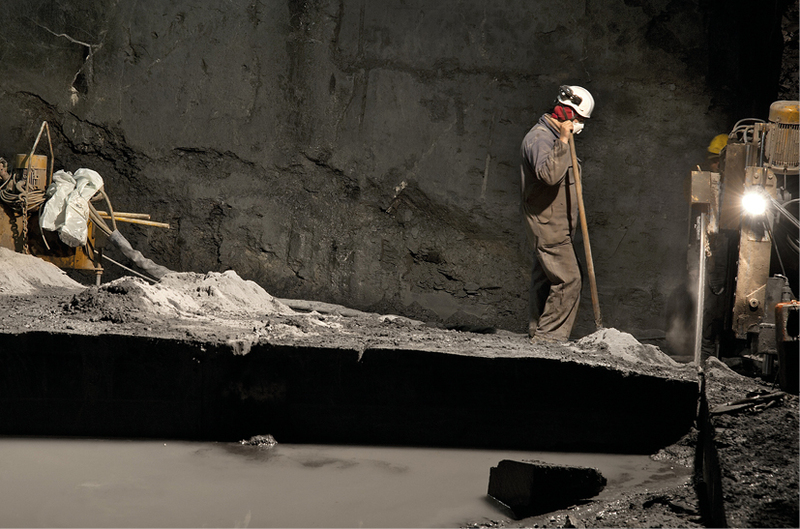 There are numerous studies that have attempted to assess which critical minerals and materials are at risk of disruption to supply. 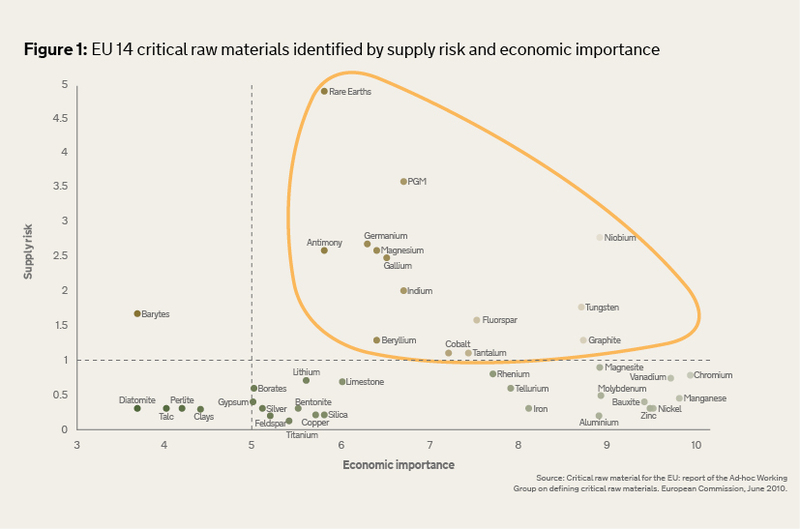 An EU study of 41 metals and materials identified 14 metals that are both of global economic importance and have supply risks including concentration of supply, stability of producing countries and ease of substitution. These are shown in Figure 1 circled in yellow. The European Commission formally adopted this list in 2011, using it to support trade negotiations and challenge trade distortion measures, and has committed to update it every 3 years. The Commission also implemented the Raw Materials Initiative in 2013, an integrated strategy to respond to different challenges related to access to non-energy and non- agricultural raw materials. None of these metals are physically scarce. However, the UK relies on imports of these critical 14 metals to satisfy the needs of our manufacturing industry, including those embedded in products and components. They are not only used in many consumer electronic products but are also critical raw materials for wind turbines and hybrid car motors, key developing industries. For example, the motors of some hybrid vehicles require up to 1kg of neodymium oxide which is reliant on neodymium, a ‘rare earth’ element largely mined in China. Inevitably, the list of critical metals and minerals will alter over time. As noted above, high prices and supply risk can drive innovation, and some businesses are addressing risks of supply through development of other technologies; the fast-changing consumer environment can make demand for previously essential items disappear; and new supply of a resource can also help limit the impact of resource nationalism, making, for example, previously mothballed production sites economically viable. But at present, substitution of these metals is difficult. Although often used in small quantities, they are critical to manufacturing processes. Therefore any restriction that limits physical supply could disrupt the whole production process. It is clear that some acts of resource nationalism could do real economic harm to individual products, companies and supply chains. The underlying motive for acts of resource nationalism is often to increase or maintain national access to resources and the revenue flow from them. For example, export restrictions and quotas are ways of securing a reliable domestic supply at the expense of other countries. Windfall taxes or compulsory nationalisation can raise governments’ revenue. Geographical production concentration can create a situation in which countries and or nations can gain from resource nationalism. 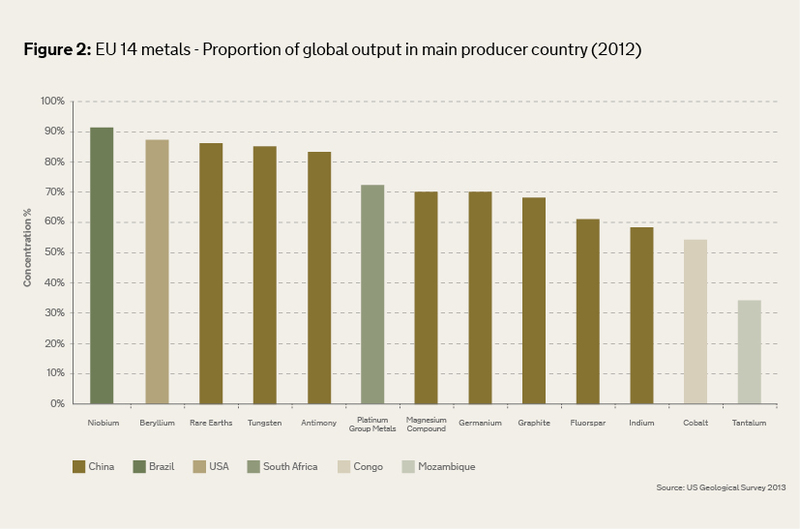 Producer concentration is a factor in several key metals: notably Brazil for niobium, USA for beryllium, China and South Africa for platinum group metals and Congo for cobalt (see Figure 2). It may not be headline grabbing news, but there have been a surprising number of acts of resource nationalism for these lesser-known but important materials. Although there are few cases of more extreme action, like co-ordinated attempts to manipulate global prices, an OECD study found incidents of export restrictions on 8 of the EU 14 metals in 39 isolated incidents. Of these, China is responsible for 33, particularly in the markets for rare earth elements and tungsten. Although there are incentives for engaging in resource nationalism, doing so can often back-fire – no country is immune to the impacts of retaliation by others, or from their customers developing alternative supplies. This can reduce the likelihood that the risks identified are realised. The Civil Service is already drawing on its strengths to minimise the risks – using its global influence to increase international awareness and promote the benefits of trade, working with a range of partners, including the EU and other international institutions. Many states are part of trade blocs, with unified trade barriers and regulation which adds a supranational dimension to aspects of resource nationalism. Nations must work together, and alongside international institutions and trading blocs in order to tackle market barriers and supply chain issues. Domestically, we have been working in partnership with business to better understand resource issues as part of the Resource Security Action Plan, working for example with the electrical sector to catalyse action and seek commitments on design for longer life, keeping products and materials in circulation for longer. And, through the Technology Strategy Board, the UK Government is participating in projects such as the Great Recovery, bringing together participants across the supply chain to stimulate innovation in design and recovery of these materials. So the next time you pick up your mobile phone or tablet, pause to think about what exactly is in your device and how it got there. Resource Nationalism will remain an important and evolving risk for businesses and governments to monitor and counter. That’s why it is important for the Civil Service to be prepared for the potential future, joining-up expertise across and beyond Whitehall to understand and address the issues that affect major areas of policy. Why should it surprise us if countries put their own national interests first? It seems perfectly normal, natural behaviour. Where necessary, I am sure that we can come up with alternatives to current technologies that are overly dependant on scarce resources or vulnerable, international supply chains. Good to see this piece of work underway. There are several angles to this including secured supply, design and - of course - secondary (recycled) materials, components and products. Happy to discuss issues facing the "waste" industry in its role in this part of a "circular economy"
Horizon Scanning! Yet another entry in the HMRC book of nonsense and Twaddle, and more money in the pockets of those who come up with it!!!!!!! !